408 pages | 345 B/W Illus. Sensor technologies have experienced dramatic growth in recent years, making a significant impact on national security, health care, environmental improvement, energy management, food safety, construction monitoring, manufacturing and process control, and more. However, education on sensor technologies has not kept pace with this rapid development … until now. 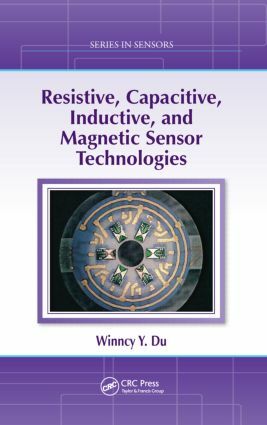 Resistive, Capacitive, Inductive, and Magnetic Sensor Technologies examines existing, new, and novel sensor technologies and—through real-world examples, sample problems, and practical exercises—illustrates how the related science and engineering principles can be applied across multiple disciplines, offering greater insight into various sensors’ operating mechanisms and practical functions. The book assists readers in understanding resistive, capacitive, inductive, and magnetic (RCIM) sensors, as well as sensors with similar design concepts, characteristics, and circuitry. Resistive, Capacitive, Inductive, and Magnetic Sensor Technologies is a complete and comprehensive overview of RCIM sensing technologies. It takes a unique approach in describing a broad range of sensing technologies and their diverse applications by first reviewing the necessary physics, and then explaining the sensors’ intrinsic mechanisms, distinctive designs, materials and manufacturing methods, associated noise types, signal conditioning circuitry, and practical applications. The text not only covers silicon and metallic sensors but also those made of modern and specialized materials such as ceramics, polymers, and organic substances. It provides cutting-edge information useful to students, researchers, scientists, and practicing professionals involved in the design and application of sensor-based products in fields such as biomedical engineering, mechatronics, robotics, aerospace, and beyond. Professor Winncy Y. Du (PE, ASME fellow) is the director of the Robotics, Sensor and Machine Intelligence Laboratory with the Department of Mechanical Engineering at San Jose State University, California, USA. She earned her Ph.D and second MS degree from Georgia Institute of Technology, Atlanta, USA; her first MS from West Virginia University, Morgantown, USA; and her BS from Jilin University, China. She has worked as a journal editor, engineer, and researcher; taught over ten different undergraduate and graduate courses; published numerous papers; and contributed to the books Smart Sensors and Sensing Technology and Modern Sensors, Transducers and Sensor Networks.